Join Let's Read at Kidspark August 19th as we launch this years book title with a special visit from author Shelly Becker! 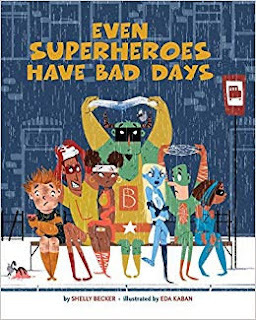 Shelly will be reading "Even Superheroes Have Bad Days" at 2pm and 3pm. Let's Read wraps up this campaign at Conestoga Mall in January 2019 at the annual Family Literacy Day* Celebration. Visit Let's Read's booth at these two events, do an activity and get a family copy of Even Superheroes Have Bad Days (while supplies last)! *Check back this fall for details about Family Literacy Day. Let’s Read is a Waterloo Region-wide program that encourages families to read together. Each year, a different book is selected for families across the region to share. Join us for FREE family programs and events held indoors and outdoors, often in unexpected places. Let's Read gratefully acknowledges the support of TD Bank Group in our family literacy campaign. TD Bank Group, a strong supporter of children's literacy, is sponsoring Let's Read again this year! With this funding, free copies of Even Superheroes Have Bad Days will be distributed to families. Families in Waterloo Region will be reading together and have their own copy of the book to keep. When books are readily available at home, children score higher on reading tests and are more interested in reading for pleasure.